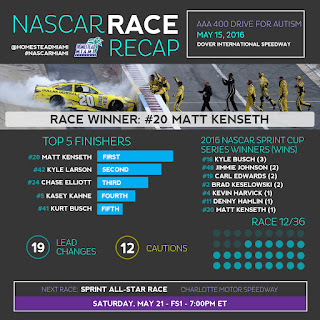 · Matt Kenseth won the 47th AAA 400 Drive for Autism at Dover International Speedway Sunday, his 37th victory in 590 NASCAR Sprint Cup Series races. It is his first victory and fourth top-10 finish in 2016. · It is Kenseth’s third victory and 23rd top-10 finish in 35 races at Dover International Speedway. · In Kenseth’s 19-year Sprint Cup career, it is the 13th time where he has at least one victory in a season. · With the triumph, all four Joe Gibbs Racing teammates (Matt Kenseth, Carl Edwards, Kyle Busch and Denny Hamlin) have made their way to victory lane this year, securing their spot in this year’s Chase for the Sprint Cup championship. · Kyle Larson (second) posted his fourth top-10 finish in five races at Dover International Speedway. It is his second top-5 and third top-10 finish in 2016. · Chase Elliott (third) posted his fourth top-5 finish and eighth top-10 finish through 12 races this season. · With Kasey Kahne’s fourth place finish in the AAA 400 Drive for Autism, he now has two top-5 and 4 top-10 finishes on the year. · Kurt Busch’s fifth place finish Sunday is his second top-5 finish in as many weeks and sixth-straight top-10. · Kevin Harvick (15th) led for a race-high 117 laps at Dover International Speedway. 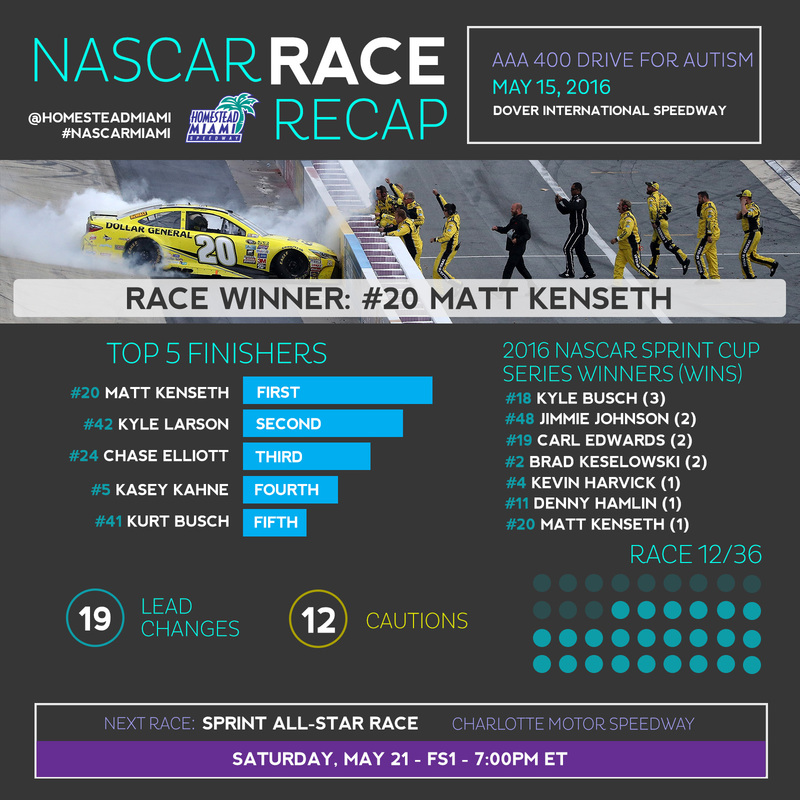 · With Sunday’s win, Matt Kenseth joins Carl Edwards, Kyle Busch, Denny Hamlin, Jimmie Johnson, Brad Keselowski and Kevin Harvick as the seven drivers to have qualified for the Chase for the Sprint Cup championship. The Chase culminates with the Ford EcoBoost 400 championship race on November 20 at Homestead-Miami Speedway. · In 16 Sprint Cup starts at Homestead-Miami Speedway, Matt Kenseth has posted four top-5 finishes and eight top 10s, including a win in the 2007 Ford 400. In 2003, Kenseth celebrated his first title at Homestead-Miami Speedway after being crowned the Winston Cup Series champion. The 2016 Chase for the NASCAR Sprint Cup will culminate at Homestead-Miami Speedway with Ford Championship Weekend, November 18-20 where the Championship 4 in each series will compete for their respective division title amongst a full field of drivers. Tickets to the 2016 Ford Championship Weekend are now available and can be purchased by calling (866) 409-RACE (7223) or visiting HomesteadMiamiSpeedway.com.